18.05.2018, Helsingør - the Georgian Vice Prime Minister, Foreign Minister Mikheil Janelidze participates in the 128th Ministerial Meeting of the Council of Europe hosted by Denmark. According to Mikheil Janelidze, it is important that the Member States of the Council of Europe comply with the fundamental principles, on which the organization is based. The Georgian Foreign Minister said that the Council of Europe is currently faced with the challenges created by its members, specificially the Russian Federation, whose actions contradict the values and principles of the organization, which is committed to the development of democracy, human rights protection and the rule of law. “Every Member State of the Counicl of Europe must comply with the decisions of the Counicl, and Russia as a party exercising effective control must ensure that respective CoE institutions have access to the region that will allow the improvement of human rights situation on the ground. We are determined to employ all levers to improve the human rights situation in the regions” – Mikheil Janelidze said. 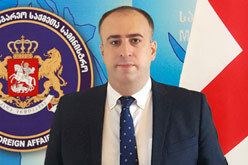 Mikheil Janelidze spoke about activities carried out with respect to Georgia within the framework of the Council of Europe, including the Secretary General’s annual report on the situation in Georgia’s occupied regions, as well as the decision of the Committee of Ministers outlining Russia’s responsibility for the violation of human rights in the occupied regions. The Minister also highlighted Georgia’s progress in implementing the co-operation plan with the Council of Europe.